Most developed economies provide significant subsidies to small businesses to encourage innovation. This column argues that while subsidies to reduce entry costs may increase entrepreneurial entry, they can also lead to a reduction in the likelihood of ‘breakthrough’ inventions. 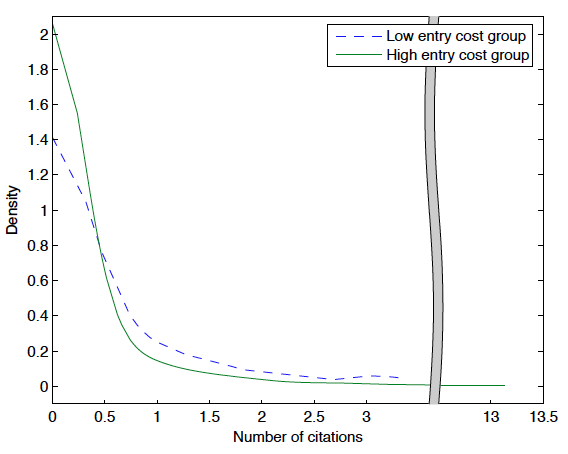 Entry costs, which are incurred when an innovation project is successful, prompt small firms and entrepreneurs to pursue high-risk, high-reward innovations. Many countries pursue policies that encourage entrepreneurship. The cost of starting a new business has declined by more than 6% each year over the period 2003-08, while the decline among OECD countries has been even more dramatic, according to the World Bank. The US Small Business Administration approves billions of dollars in loans and guarantees to small businesses every year. In his State of the Union address in September 2017, European Commission President Jean-Claude Juncker credited the European Investment Plan for “triggering investments for 225 billion euros and granting loans to 450,000 small firms and more than 270 infrastructure projects”. Our research suggests, however, that such policies may be wrongly focused. Subsidies for small-scale entry, while helping small firms, may not be conducive to optimal economic growth. Focusing more on R&D support may be preferred. Business sectors in most European countries have struggled with both low productivity growth and a lack of dynamism in the innovation process. In addition, entrepreneurship has long been recognised as a key determinant for economic development and growth. Firms of very modest size have been responsible for most pioneering breakthroughs, and new entrants without a commitment to incumbent technologies have been responsible for a substantial share of truly revolutionary industrial products and processes. The empirical literature on firm size and innovative activity demonstrates clearly that “larger, incumbent firms tend to pursue relatively more incremental and relatively more process innovation than smaller firms” (Cohen 2010). In today’s global ICT-based economy, breakthrough entrepreneurship seems to be even more important for successful business sector development. For instance, Sweden, which has had one of the few flourishing business sectors in the EU over the last decades, has created breakthrough entrepreneurial firms on a level that is unexpected for a country with a population of roughly 10 million. Global entrepreneurial firms such as music-streaming service Spotify, online-payment firm Klarna, and King, the gaming company, are all Swedish. Moreover, Stockholm produces the second-highest number of billion-dollar tech companies per capita after Silicon Valley ([email protected] 2015). These observations raise two important questions. First, why is there this ‘division of labour’ in the innovation process wherein small independent firms (entrepreneurs) embark on radical business projects characterised by large uncertainties (i.e. low success probability) but high value in case of success? Second, what are the effects in practice of policies aimed at fostering entrepreneurship? A starting point of our recent paper (Färnstrand Damsgaard et al. 2017) is that small, independent firms have neither complementary assets nor experience of commercialising new products, and therefore face much higher costs of commercialising an invention than incumbents do. As highlighted by Gans and Stern (2003), “a key management challenge is how to translate promising technologies into a stream of economic returns for their founders, investors and employees. In other words, the problem is not so much invention but commercialization.” Our main goal is therefore to investigate whether the existence of significant differences in commercialisation costs might influence the type of R&D conducted by different players contributing to the innovation process. By so doing, we uncover a radically new explanation for the empirical observation that small firms are responsible for a disproportionate share of major breakthrough innovations to date. To explore how this initial disadvantage of small firms and entrepreneurs shapes innovation incentives, we develop a model where an incumbent and an entrepreneur both invest in R&D projects that might lead to an invention. There are different types of R&D projects to choose from, where a project with a lower probability of success is associated with a higher payoff if it succeeds. In addition, a key feature of the model is that if the entrepreneur turns out to be successful with her chosen research project, she will face a cost when commercialising the corresponding invention. However, the incumbent who is already active in the market will not have to pay any such cost. The model reveals that entrepreneurs have incentives to embark on projects with high risk and high potential. We refer to this as the entrepreneurship hurdle effect. The entry cost associated with commercialisation of the entrepreneur’s invention implies that the entrepreneur opts for a project that involves more risk since, by so doing, she reduces the expected entry cost (as the entry cost is only paid when the project succeeds). This entrepreneurship hurdle effect can be illustrated in a simple example. Consider a situation where there are two research projects which firms can choose from. Project A is a risky project and has an associated payoff of 20 with probability 0.5, and therefore a pay-off of 0 with probability 0.5. In contrast, Project B is a completely safe project with a certain payoff of 10. Thus, risky project A can give the inventor a substantially larger return than safe project B, but the downside is that the risky project can also leave the inventor completely without a return. Which project should the inventor choose? Note that an incumbent firm facing a zero-commercialisation cost is indifferent towards projects A and B – the expected profit or return of risky project A is simply 0.5 x 20 + 0.5 x 0 = 10. Now, consider a small entrepreneurial firm. Suppose that the entrepreneur faces an entry cost of, say, 5 if she decides to commercialise the invention. Then, she must prefer the risky project, since her expected net profit with the risky project is (20-5) × 0.5 + 0 × 0.5 = 7.5, which is larger than the return from the safe project, which will give her 10 – 5 = 5. The key to understanding why the entrepreneur prefers risky project A over safe project B is that she only pays the commercialisation or entry cost if she succeeds with project A. The entrepreneurship hurdle effect thus gives smaller firms and entrepreneurs a greater incentive to take on riskier projects than incumbent firms. But our analysis also reveals a reason why incumbents prefer to go safer. This is the entry deterring effect. Success with a minor invention might enable the incumbent to block entry to the market by an entrepreneur. Thus, from an incumbent’s view point, a successful innovation may not only give rise to cost savings or a new product, but can also be used to deter entry. For this reason, the incumbent will also tend to choose less risky projects. The entrepreneurship hurdle effect therefore predicts that higher entry costs should result in more risk-taking, as entrepreneurs will steer their innovation efforts towards projects that have a low probability of success but a high pay-off if they do succeed. Thus, while we should observe abundant entrepreneurial failures, when entrepreneurs do succeed with their projects the associated inventions should be of a higher quality. Figure 1 plots the number of patent citations for a group of inventors who owned a firm at the application date, and who therefore had small commercialisation costs, and for a group of individual inventors who did not own a firm at the application date, thus facing higher commercialisation costs. The empirical data described and discussed in detail in a working paper version of our study (Färnstrand Damsgaard et al. 2012). The figure shows that the group of individual inventors is associated with a larger proportion of patents which are never cited, but also with a higher proportion of inventions with many citations (i.e. breakthrough inventions). This is indeed what one would expect from the entrepreneurship hurdle effect identified in the theoretical analysis. This research suggests that policymakers, when designing entrepreneurial policies, should consider not only firms' incentives to undertake R&D projects, but also the type of research projects they expect to be conducted when those policies are implemented. In particular, our study shows that policies designed to reduce entry costs could stimulate entrepreneurship, but entrepreneurship that takes too little risk from a point of view of a society in which consumers benefit from breakthroughs that challenge incumbents. Put another way, an entrepreneurial policy leading to a significant decrease in the cost of commercialisation can give rise to more entrepreneurial entry, but at the same time to a reduction in the likelihood of breakthrough inventions. Our study also illustrates how entrepreneurship policies might need to be adapted to the specifics of the product market. The policymaker should complement R&D subsidies with a tax on entry in markets characterised by a low degree of product differentiation, but may complement the R&D subsidy with a subsidy to entry in product markets with a high degree of product differentiation. Authors’ note: The opinions expressed in this column are the sole responsibility of the authors and do not necessarily reflect the views of NIER. Cohen, W M (2010), “Fifty Years of Empirical Studies of Innovative Activity and Performance”, ch.4 in B H Hall and N Rosenberg (eds. ), Handbook of the Economics of Innovation, Vol. 1, North-Holland, p.129-213,. Gans, J, and S Stern (2003), “The Product Market and the Market for ‘Ideas’: Commercialization Strategies for Technology Entrepreneurs”, Research Policy 32(2): 333-350. Färnstrand Damsgaard, E, P Hjertstrand, P-J Norbäck, L Persson, and H Vasconcelos (2017), “Why Entrepreneurs Choose Risky R&D Projects – But Still Not Risky Enough”, Economic Journal 127: F164–F199. Färnstrand Damsgaard, E, P Hjertstrand, P-J Norbäck, L Persson, and H Vasconcelos (2012), “Why Entrepreneurs Choose Risky R&D Projects - But Still Not Risky Enough”, IFN Working Paper, no. 926. [email protected] (2015), “How Stockholm Became a ‘Unicorn Factory’”, 9 November.